It’s no secret that Chicago is a beer town, with lots of awesome breweries and taprooms to explore. While there are so many to choose from, here are the top five breweries currently on our radar to check out this spring. Buffalo Creek Brewing in Historic Downtown Long Grove is definitely worth the trek. The Lake County destination brewery, is popular year-round for its Bavarian-themed taproom and scenic entertainment space, centered around the art of brewing. , The outdoor beer garden is perfect for summer days, and the taproom’s distinctive cedar walls, hand-hammered copper bar, and whiskey barrel high tops are cozy for winter outings. This California brewing company with a cult following makes the list for a number of reasons. The taproom features live music five nights a week, yummy bar snacks and shareable plates, seasonal offerings, and limited release beers. The patio overlooks the production area, and it’s dog friendly! Two days a week, the taproom closes to host local nonprofit events. What’s not to love? Check out Lagunitas Wednesdays through Sundays. A new-ish brewery to join the Chicago beer scene, West Town’s Forbidden Root Brewery is perfecting craft beer by using fresh, aromatic, and seasonal ingredients inspired by nature. As Chicago’s first botanical brewery, the folks at Forbidden are brewing up everything from sparkling rosé ale to strawberry-basil hefeweizen. You can try some truly unique beers, or sample the brewery’s traditional IPAs and other classic brews. Bonus: the brewery is also a restaurant that serves up a brunch like no other. 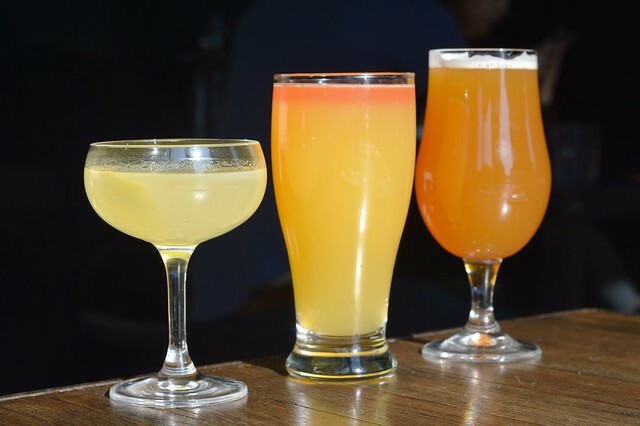 The 2019 Jean Banchet Award winner for best bar,this uber chic aproom is one of the coolest breweries in Chicago. Located in a historic former glass factory, the space boasts a mid-century modern vibe, plus, there is a cozy fireplace to nestle up next to. Enjoy unique, decadent craft beers paired with their famous 12 layer chocolate cake. This is a refined drinking experience that you must try. No list of essential Chicago breweries would be complete without our choice for number one, Band of Bohemia. Band of Bohemia, the world’s first ever Michelin-starred brewpub, is a unique culinary experience to say the least. What started with beer has grown to become a must-try brew and food journey unlike any other. As the name suggests, this brewery is laid back and boho chic with Victorian light fixtures and jewel-toned, velvet furniture. But this place is so much more than its chic interior decor. Expect to have an out-of-this-world dining adventure thanks to playful food and drink pairings that entice the senses and challenge your palate.